Mystical Izalco portends the end of Salvadoran silence. To understand the current presidential elections in El Salvador, you have to understand the cities, towns and the campo, El Salvador’s countryside, located outside the capital of San Salvador. What follows is my attempt to provide further context for the media’s description of the horse race between the FMLN and the ARENA parties. A good starting point is the fact that both parties trace all or some of their political roots to Izalco, a relatively small town in the western, coffee-growing part of the country. Izalco is also home to one of the largest concentrations of El Salvador’s small (less than 1% of the population) indigenous population. For strange, tragic, even mysterious reasons, Izalco, which in the racist popular national lore (ie; one way to call someone ugly is to say they look “indio”) is home to witches, is also home to what, in my opinion, is the ever-present, but unspoken political and cultural spirit of the country. And this region also concentrates large numbers of volcanos, some of which are also quite alive (see above) , as are the narrow and crowded streets of Izalco (below). If we want want to take the political pulse of a country as poor (50% of the population lives in poverty) as El Salvador, speaking with people who are not just poor, but a small, indigenous poor minority living in such an enchanting and dark land will give us a unique read. Not all people here in Izalco identify as native people, but all recognize and live indigenous reality like few other places in this country of 7 million. You can see the indigenous presence in the sublime faces of the kids here. And you can find the indigenous presence in the deep, dark soil of Izalco’s history. Almost all of the children from Izalco’s Mario Calvo school pictured above are descendants-great, great and great, great, great, grandchildren- of the 20,000-30,000 indigenous people who rebelled against deadly poverty and abuse and were then slaughtered in 1932 by General Maximiliano Hernandez Martinez, the dictator who perpetrated what is known as “La Matanza” (the Great Killing). Martinez and his troops did all this in less than a month, according to scholars like my friend Aldo Lauria-Santiago, whose book is pictured below with a cover of the Izalco volcano. Recent research like Aldo’s and that of other scholars reveals that the idea that the rural insurrection in the west was led by urban communists of the period like Farabundo Marti is wrong. In fact, these scholars tell us, it was led by the ancestors (below) of the children pictured above. Below is the picture of the real leader of the insurrection, Jose Feliciano Ama. 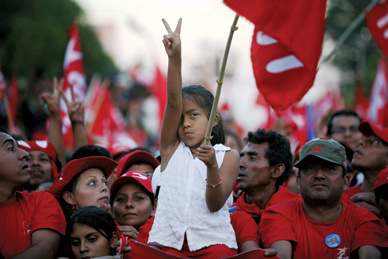 Despite recent research, many still blur the differences between the communists and the indigenous rebels of the period. 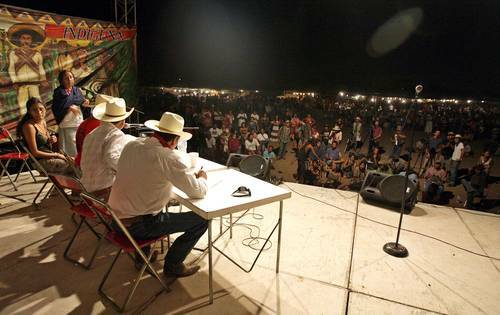 Even many members of the Farabundo Marti National Liberation Front (FMLN) make the mistake as do members of the governing ARENA party, which was founded in Izalco by Roberto D’abuisson. D’abuisson also founded El Salvador’s notorious death squads, one of which was named for the old dictator, Hernandez Martinez. I actually have no idea who the group of Izalco Areneros pictured above are. I visited the office and spoke with the directores of Arena’s campaign in Izalco, who told me why their message of “democracy,” their message of “freedom” from the threat of El Salvador becoming a “Hugo Chavez satellite” moves Izalco’s voters. ; The directores also lauded D’abuisson, whom they met, and Hernandez Martinez, whom they admire. The events of 1932, they said, saved the country from comunismo and laid the foundation for the later formation of the ARENA party. For these and other reasons, they said , ARENA always begins its presidential campaigns in Izalco, as they did when this year’s presidential candidate, private security mogul and former head of the national police, Rodrigo Avila, came here to kickoff his campaign. The directores also showed me a copy of the ARENA anthem which hails El Salvador as the “tomb where the reds will be terminated.” I thought it odd that, rather than let me take their picture, the directores told the people pictured above to stand outside the ARENA office, where I took the picture. Less than half a small block to the right of the ARENA office is the large (1.5 blocks) field where most of the indigenous people killed in 1932 are buried in an anonymous mass grave (see picture of plaque and smoky Izalco volcano in background below) excavated by forensic scientists from Argentina in 2007. Pictured above in the blue shirt is Roberto Alvarado, a member of the FMLN and Mayor-elect of Izalco whose stunning victory last January reflects the depths of the changes here and in the entire country. 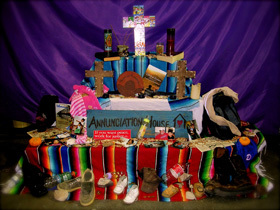 “They sang that stupid song about “the tomb of the reds,” Alvarado,a former teacher who was pursued by death squads, told me adding, “Now we are going turn Izalco, the cradle of ARENA, into the the political grave of the ARENA party.” Alvarado’s coalition-students, indigenous communities, Catholics and evangelicos– provided the FMLN with a major spiritual and political victory -and a model to be emulated across the country. The unprecedented openness expressed in the shoes, shops and streets of Izalco has many, many reasons and thousands of people to thank for it. Together, these forces ended the silence that cast a permanent cloud over Izalco -and El Salvador-after the events of 1932. One of today’s most vocal and effective breakers of the silence is Juliana Ama, director of the Calvo school that teaches nahuatl. She is also the great, great granddaughter of rebel leader, Jose Feliciano Ama (above). Since 2001, Juliana has organized commemoration ceremonies every January at the site of the mass grave near the ARENA office in Izalco, ceremonies that draw conflict and controversy. Despite the tensions, despite the threats she has received, Ama soldiers on in what she defines first and foremost as a”spiritual act” because, she says, “we have no choice; we can’t remain and suffer in silence.” Juliana also believes that there is a direct link between the commemoration ceremonies and the defeat of the ARENA party. “Those ceremonies made it normal and acceptable to be open about the loss of long ago, the loss that still lives with us,” she said. “Nothing like this was ever possible before and I think that the ceremony made it possible for people to start being more open about political feelings too. 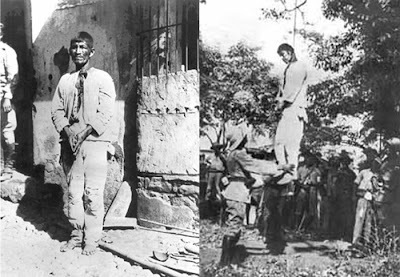 Finally, as the son of the 10 year-old boy who witnessed and survived la Matanza and then went on to become my father, I want to thank Juliana and the people of Izalco for their example, their courage and their great wisdom. If you want to hear what a Real Leader sounds like with regard to immigration policy, check out Bolivian President Evo Morales’ Open Letter to the European Union (EU) about the today’s vote EU vote on its “Return Directive,” which calls for a U.S.like deportation of undocumented persons from EU territories. I had the pleasure of interviewing President Morales during his visit to the U.N. last year and found him to be a leader of extraordinary insight, intelligence and deep conviction. Instead mimicking the Bush Administration’s drug war-crazed policy of undermining Morales and other Latin leaders, Presidential candidates Obama and McCain might, instead try to learn from Bolivia’s first indigenous head of state in 500 years, especially when it comes to the immigration that started with those “illegals” whose boats were packed with all the trappings of “civilization”: bibles crammed next to the big canons and muskets and balls and chains. Europeans arrived en masse to Latin and North America, without visas or conditions imposed on them by the authorities. They were simply welcomed, and continue to be, in our American continent, which absorbed at that time the European economic misery and political crisis. They came to our continent to exploit the natural wealth and to transfer it to Europe, with a high cost for the original populations in America. As is the case of our Cerro Rico de Potosi and its fabulous silver mines that gave monetary mass to the European continent from the 16th to the 19th centuries. The people, the wealth and the rights of the migrant Europeans were always respected. And, if you’d like to sign a petition calling on the EU to reject the Return Directive, go here. There’s much more in this letter that should be studied and emulated. So check it out and enjoy – and imagine. Up until the end of the World War II, Europe was an emigrant continent. Tens of thousands of Europeans departed for the Americas to colonize, to escape hunger, the financial crisis, the wars or European totalitarianisms and the persecution of ethnic minorities. Today, I am following with concern the process of the so called “Return Directive”. The text, validated last June 5th by the Interior Ministers of 27 countries in the European Union, comes up for a vote on June 18 in the European Parliament. I feel that it is a drastic hardening of the detention and expulsion conditions for undocumented immigrants, regardless of the time they have lived in the European countries, their work situation, their family ties, or their ability and achievements to integrate. Today, the European Union is the main destiny for immigrants around the world which s a consequence of its positive image of space and prosperity and public freedoms. The great majority of immigrants go to the EU to contribute to this prosperity, not to take advantage of it. They are employed in public works, construction, and in services to people in hospitals, which the Europeans cannot do or do not want. They contribute to the demographic dynamics of the European continent, maintaining the relationship between the employed and the retired which provides for the generous social security system and helps the dynamics of internal markets and social cohesion. The migrant offers a solution to demographic and financial problems in the EU. For us, our emigrants represent help in development that Europeans do not give us – since few countries really reach the minimum objective of 0.7% of its GDP in development assistance. Latin America received, in 2006, remittance (monies sent back) totaling 68,000million dollars, or more than the total foreign investment in our countries. On the worldwide level it reached $300,000 million dollars which is more than US $104,000 million authorized for development assistance. My own country, Bolivia, received more than 10% of the GDP in remittance (1,100 million dollars) or a third of our annual Exports of natural gas. Unfortunately, “Return Directive” project is an enormous complication to this reality. If we can conceive that each State or group of States can define their migratory policies in every sovereignty, we cannot accept that the fundamental rights of the people be denied to our compatriots and brother Latin-Americans. The “Return Directive” foresees the possibility of jailing undocumented immigrants for up to 18 months before their expulsion – or “distancing”, according to the terms of the directive. 18 months! Without a judgment or justice! As it stands today the project text of the directive clearly violates articles 2, 3, 5,6,7,8 and 9 of the Universal Declaration of Human Rights of 1948. And, the worst of all, is that the possibility exists for the mothers of families with minor children to be arrested, without regards to the family and school situation, in these internment centers where we know that depression, hunger strikes, and suicide happens. How can we accept without reacting for them to be concentrated in camps our compatriots and Latin American brothers without documents, of which the great majority have been working and integrating for years. On what side is the duty of humanitarian action? Where is the “freedom of movement”, protection against arbitrary imprisonment? On a parallel, the European Union is trying to convince the Andean Community that the Nations (Bolivia, Colombia, Ecuador and Peru) to sign an “Association Agreement” that includes the third pillar of the Free Trade Agreement, of the same nature and content as that imposed by the United States. We are under intense pressure from the European Commission to accept conditions of great liberalization of our trade, financial services, intellectual property rights and our public works. In addition under so called “judicial protection” we are being pressured about the nationalization of the water, gas and telecommunications that were done on the Worldwide Workers’ Day. I ask, in that case, where is the “judicial protection” for our women, adolescents, children and workers that look for better horizons in Europe? Under these conditions, if the “Return Directive” is passed, we will be ethically unable to deepen the negotiations with the European Union, and we reserve the right to legislate such that the European Citizens have the same obligations for visas that they impose on the Bolivians from the first of April 2007, according to the diplomatic principal of reciprocity. We have not exercised it up until now, precisely because we were awaiting good signs from the EU. In the name of the people of Bolivia, of all of my brothers on the continent and regions of the world like the Maghreb and the countries of Africa, I appeal to the conscience of the European leaders and deputies, of the peoples, citizens and activists of Europe, for them not to approve the text of the “Return Directive”. As it is today, it is a directive of vengeance. I also call on the European Union to elaborate, over the next months, a migration policy that is respectful of human rights, which allows us to maintain this dynamics that is helpful to both continents and that repairs once and for all the tremendous historic debt, both economic and ecological that the European countries owe to a large part of the Third World, and to close once and for all the open veins of Latin America. They cannot fail today in their “policies of integration” as they have failed with their supposed “civilizing mission” from colonial times. Hoy, estoy siguiendo con preocupación el proceso de la llamada “directiva retorno”. El texto, validado el pasado 5 de junio por los ministros del Interior de los 27 países de la Unión Europea, tiene que ser votado el 18 de junio en el Parlamento Europeo. Siento que endurece de manera drástica las condiciones de detención y expulsión a los migrantes indocumentados, cualquiera sea su tiempo de permanencia en los países europeos, su situación laboral, sus lazos familiares, su voluntad y sus logros de integración. Para nosotros, nuestros migrantes representan la ayuda al desarrollo que los Europeos no nos dan – ya que pocos países alcanzan realmente el mínimo objetivo del 0,7% de su PIB en la ayuda al desarrollo. América Latina recibió, en 2006, 68.000 millones de dólares de remesas, o sea más que el total de las inversiones extranjeras en nuestros países. A nivel mundial alcanzan 300.000 millones de dólares, que superan a los 104.000 millones otorgados por concepto de ayuda al desarrollo. Mi propio país, Bolivia, recibió mas del 10% del PIB en remesas (1.100 millones de dólares) o un tercio de nuestras exportaciones anuales de gas natural. Lamentablemente, el proyecto de “directiva retorno” complica terriblemente esta realidad. Si concebimos que cada Estado o grupo de Estados puede definir sus políticas migratorias en toda soberanía, no podemos aceptar que los derechos fundamentales de las personas sean denegados a nuestros compatriotas y hermanos latinoamericanos. La “directiva retorno” prevé la posibilidad de un encarcelamiento de los migrantes indocumentados hasta 18 meses antes de su expulsión -o “alejamiento”, según el término de la directiva. ¡18 meses! ¡Sin juicio ni justicia! Tal como esta hoy el proyecto de texto de la directiva viola claramente los artículos 2, 3, 5, 6, 7, 8 y 9 de la Declaración Universal de los Derechos Humanos de 1948. Y, lo peor de todo, existe la posibilidad de encarcelar a madres de familia y menores de edad, sin tomar en cuenta su situación familiar o escolar, en estos centros de internamientos donde sabemos ocurren depresiones, huelgas de hambre, suicidios. ¿Cómo podemos aceptar sin reaccionar que sean concentrados en campos compatriotas y hermanos latinoamericanos indocumentados, de los cuales la inmensa mayoría lleva años trabajando e integrándose? ¿De qué lado esta hoy el deber de ingerencia humanitaria? ¿Dónde está la “libertad de circular”, la protección contra encarcelamientos arbitrarios? Paralelamente, la Unión Europea trata de convencer a la Comunidad Andina de Naciones (Bolivia, Colombia, Ecuador y Perú) de firmar un “Acuerdo de Asociación” que incluye en su tercer pilar un Tratado de Libre Comercio, de misma naturaleza y contenido que los que imponen los Estados Unidos. Estamos bajo intensa presión de la Comisión Europea para aceptar condiciones de profunda liberalización para el comercio, los servicios financieros, propiedad intelectual o nuestros servicios públicos. Además a título de la protección jurídica se nos presiona por el proceso de nacionalización del agua, el gas y telecomunicaciones realizados en el Día Mundial de los Trabajadores. Pregunto, en ese caso ¿dónde está la “seguridad jurídica” para nuestras mujeres, adolescentes, niños y trabajadores que buscan mejores horizontes en Europa? Bajo estas condiciones, de aprobarse esta “directiva retorno”, estaríamos en la imposibilidad ética de profundizar las negociaciones con la Unión Europea, y nos reservamos del derecho de normar con los ciudadanos europeos las mismas obligaciones de visa que nos imponen a los Bolivianos desde el primero de abril de 2007, según el principio diplomático de reciprocidad. No lo hemos ejercido hasta ahora, justamente por esperar buenas señales de la UE. A nombre del pueblo de Bolivia, de todos mis hermanos del continente regiones del mundo como el Maghreb, Asia y los países de Africa, hago un llamado a la conciencia de los líderes y diputados europeos, de los pueblos, ciudadanos y activistas de Europa, para que no se apruebe e1 texto de la “directiva retorno”. Tal cual la conocemos hoy, es una directiva de la vergüenza. Llamo también a la Unión Europea a elaborar, en los próximos meses, una política migratoria respetuosa de los derechos humanos, que permita mantener este dinamismo provechoso para ambos continentes y que repare de una vez por todas la tremenda deuda histórica, económica y ecológica que tienen los países de Europa con gran parte del Tercer Mundo, que cierre de una vez las venas todavía abiertas de América Latina. No pueden fallar hoy en sus “políticas de integración” como han fracasado con su supuesta “misión civilizatoria” del tiempo de las colonias. Their fangs still dug deep into the rancid carcass of the “Obama-Wright controversy”, the mainstream media and candidates Clinton and McCain have birthed yet another member of the army of walking dead threatening our political system: the Obama-Wright Zombie (And no, the word “zombie” is not being used with any racial connotations or subtexts……I don’t work for the Clinton’s). Though the visibly weakened Obama has addressed the the issue in a manner that would slay other issues, the Zombie walks, it lives. And while I feel for Obama personally and though I hope his candidacy doesn’t succumb to this frenzy of political flesh-eaters, my primary concerns are for what the zombie means for race, politics and religion in the U.S. I watched Wright’s rather lengthy and often eloquent disquisition and defense and find in Obama’s knuckling under to pressure with today’s denunciation of his former pastor reason for concern. Say what you will about Wright, he is, as he stated in his speech, part of a powerful, anti-racist tradition of liberation and faith. Lost in most of the mainstream coverage of Wright’s speech was the Reverend’s contextualization of his statements and life in the very political tradition of the black church. Wright’s comments about the U.S. as an “imperialistic” power that suffered what military analysts like Chalmers Johnson calls “blowback” were taken out of context and fed the still-lingering appetite of a country that prefers reproducing racial superficialities to reconciling the genocidal acts of its history. Wright reminded his audience that Jesus also predicted that the fall of empire under the weight of its own sins. Had Jesus used metaphors that included “chickens” roosting, he too would be electronically whipped and visually stoned and stoned and stoned again. Also saddening was hearing Obama “outraged” at Wright’s comments about the consequences of U.S. empire. While we can’t expect someone aspiring to to occupy the seat of imperial power to do anything but defend “American exceptionalism” and other Disneyesque myths designed to coverup the U.S.’s bloody history, we should expect Obama not to reproduce the lies and half truths about race, exploitation and violence that are a part of this history.”Hope” can’t serve as a cover for violence; And talk of “change” shouldn’t magically transport us into a state of amnesia. Beware of zombie politics and the Svengali politics of Democrats and Republicans. BREAKING NEWS: MR. 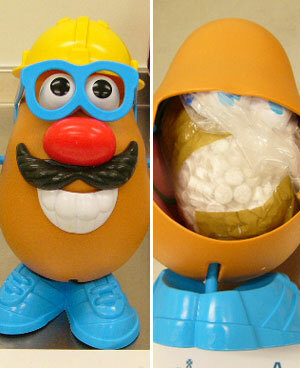 POTATO HEAD, A DRUG-RUNNING LATINO? Drug Enforcement authorities in Australia conducted a massive raid in which they nabbed a man identified as a “drug-smuggling-immigrant-gang-terrorist” by US officials and anti-immigrant organizations. While it may be new to the Aussies, we here in the states know the profile all-too-well: the thick black mustache, the brown skin, the big nariz, the cheap tennis shoes and that deceptive smile- all of them a front for what’s really inside- ecstasy. Though authorities declined to say the nationality of the mustachioed culprit, known only as “Senor Papa”, anonymous sources say that the suspect hails from El Salvador or Mexico. Let’s hope the Aussies, our loyal allies in Iraq, learn from us and start Walling off the island as they declare war on these cartoonish fiends. For more information, see this story in Australia’s Age newspaper. 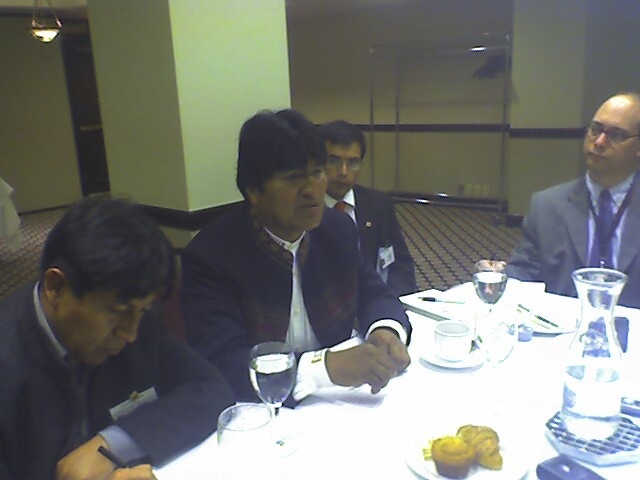 I had the privilege and honor of having breakfast with Bolivian President Evo Morales this morning. He met with a small group of journalists and discussed a number of issues including the Bolivian economy, US foreign policy (better known as intervencion), the need to extradite former Bolivian President Sanchez de Lozada so he can face genocide charges, indigenous rights and constitutional reform to name a few (more detailed report after his speech at the UN manana). 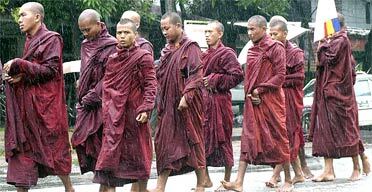 In what appears to mark the beginning of a saffron-robed revolution, thousands of Buddhist monks have taken to the streets of Myanmar this week as discontent with the military junta – and increased fuel prices – grows rapidly. 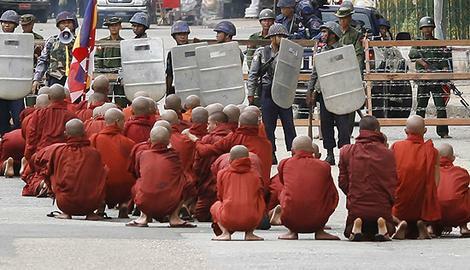 In response, the monks temporarily locked members of the security forces inside a monastery. As fuel prices increase, as housing prices plummet and as growing numbers of children here in the US enter the ranks of the medically uninsured, maybe some of us here should meditate and march against our own budget-and people–killing militarism.